This is the plugin demo in action..
You'll need to test this on a real device as a Simulator/Emulator doesn't have speech recognition capabilities. 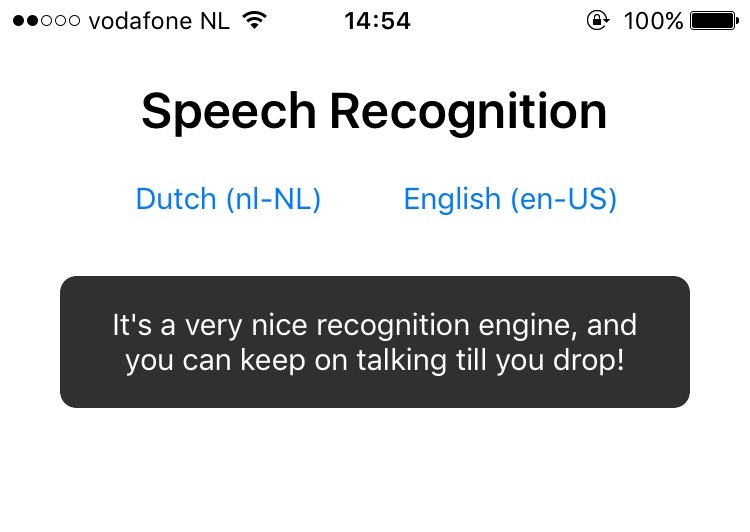 Depending on the OS version a speech engine may not be available. // - iOS: A 'string', describing the issue. // - Android: A 'number', referencing an 'ERROR_*' constant from https://developer.android.com/reference/android/speech/SpeechRecognizer. //            If that code is either 6 or 7 you may want to restart listening. // hence the' onError' handler was created. If you're using this plugin in Angular, then note that the onResult callback is not part of Angular's lifecycle. So either update the UI in an ngZone as shown here, or use ChangeDetectorRef as shown here. Rather watch a video? Check out this tutorial on YouTube.